ORAZIO Fantasia is making steady progress from his finger injury and will play in Essendon's JLT Community Series pre-season games. The exciting forward, who had a run of injuries last season, suffered the finger issue last year after a tackle that went wrong during pre-season training. He didn't take part in the Bombers' short match simulation drills at their training session on Wednesday but completed all other work while wearing a glove. The 23-year-old said the injury was tracking well after the initial frustration. "The finger's going really, really well. It's healed really nicely, which is how the specialist thought it would," he said. "I just have to wear a bit of protective gear still, so that's why you saw the glove the other day. I'm back into training now, which is good." Fantasia has become a key member of Essendon's line-up, and is also a part of its five-man leadership group. He blamed his own poor tackling attempt for the interruption to his pre-season. "It was probably my own bad technique in the first place. I was reaching for a tackle and got it caught in a jumper and felt it pop and knew it was something pretty significant straight away," he said. Fantasia enjoyed a breakout season in 2017, when he kicked 39 goals from 20 games and wowed the competition with his speed and accurate kicking in attack. 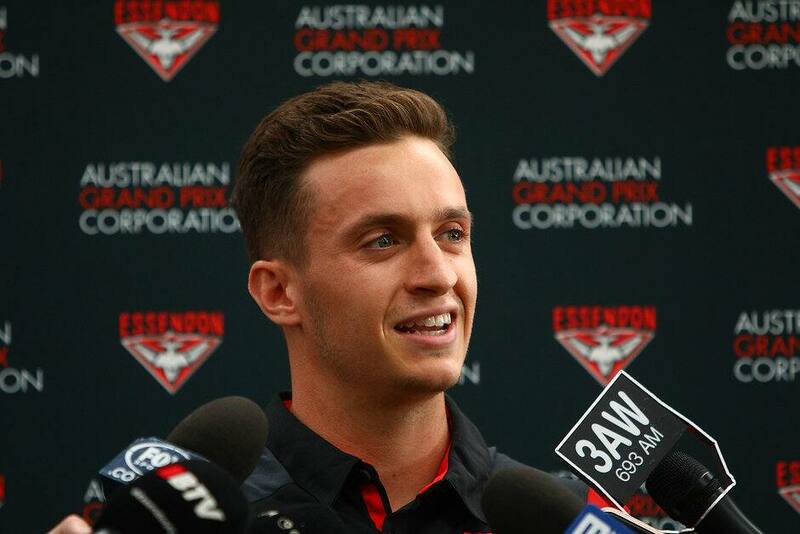 A knee injury during last year's pre-season, however, and then soft-tissue concerns through the Bombers' campaign, restricted him to 13 games and 20 goals. He feels far better prepared for their 2019 season despite the finger setback. "Last year for me I had my knee injury and didn't start running until January or February, which put me pretty far behind and [I was] trying to catch up with no [fitness] base. Luckily this time I was able to run and get that base in, and the body's feeling really good," he said. Fantasia said he would be lining up for the Bombers against Carlton in their JLT Community Series opener on Thursday, February 28 at Ikon Park. They then face Geelong on March 7, before their home and away season opens against Greater Western Sydney. The Bombers will be hoping not to repeat their start to last year that saw their finals hopes sink after they managed just two wins from the opening eight rounds, but Fantasia said getting off to a quick beginning wasn't a focus. "It hasn't even been in our frame of mind. At the moment we're just focusing on process, getting everyone fit, getting our structures and team right, and after that we'll see," Fantasia said.